Bring some of the seaside theme into your home with this large wall mounted mirror. The perfect bathroom mirror for a nautical feel or hang in the living room or hallway for that quirky display. This mirror brings some different to your decor with it's unusual and quirky design. 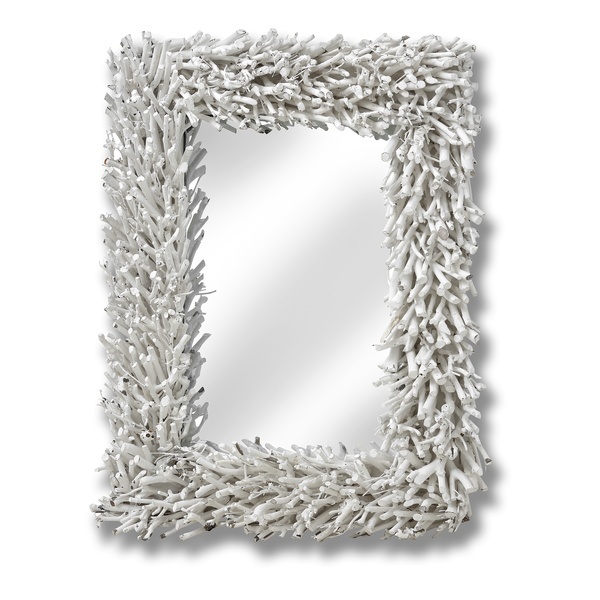 The frame is made from driftwood in a distressed white finish around a rectangular portrait style mirror. This mirror will easily fit into a modern or traditionally styled interior. Bring some of the seaside theme into your home with this large wall mounted mirror. The perfect bathroom mirror for a nautical feel or hang in the living room or hallway for that quirky display. This mirror brings some different to your decor with it's unusual and quirky design. The frame is made from driftwood in a distressed white finish around a rectangular portrait style mirror. This mirror will easily fit into a modern or traditionally styled interior. Constructed with a driftwood style frame in a distressed white finish. Easily wall mounted with fixings on the back. Our extensive range of wall mirrors are certainly impressive. With a large choice of styles, colours and designs with something to suit every interior.